Ayonika Paul raised hopes of a gold but missed in her last shot. A hearty lunch had been had by all by then, and Delhi’s mild sunny breeze and a post-noon cloudy haze was begging for a siesta. That the sport of shooting can at times be soporific – is something even a diehard will grudgingly admit. 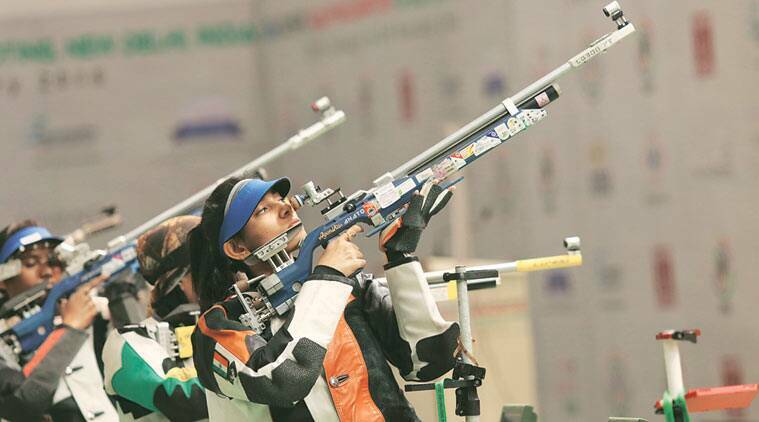 The stakes were high for those who had gathered at the Karni Singh Range’s 10m hall – there were two quota places and seven contenders in the women’s 10m air rifle final. But you wouldn’t blame the odd spectator for starting to doze off when the final featuring two Indians, three Singaporeans, a Mongolian, a world-beating Iranian and a Korean started at 4 o clock. Except, Ayonika Paul and Pooja Ghatkar, jolted every sleepy soul into such wide-eyed wakefulness with their tremendously exhilarating and unblinking shooting spree that the sport and its final format earned itself a pat on the back. Heena Sidhu had dominated the field and Kynan Chenai had toiled for his quota in the last two days. Paul and Ghatkar popped eyeballs and won hearts. Paul (23), four years junior, ended with the Olympic quota, but rarely has any event in India looked in such fine fettle as when the two girls got cracking on their shots. The final mark of 205 – with the Iranian winning gold – might not point to a high-scoring final, but no one in the range on Friday could’ve asked for more from the two home girls who made the finals with scores of 418.8 (Paul) and 415.6 (Ghatkar). Ghatkar would start with 10.7, following up with 10.6 immediately in the 8-women final where all save one were in contention to get the twin Rio berths. Paul would start indifferently with 9.6 but drilled a 10.8 by her sixth shot. Ghatkar would stay on top of the leaderboard, and Paul caught up, signalling pretty early in the day that the Indians were in it to win it. Shot 8: Ghatkar – 10.7, Paul – 10.6; the scores reversed two shots later. The two would even drop down simultaneously – 9.9 for Pooja, with Ayonika dipping under 10 to 9.8 on the same shot two lanes away. They’d both hit 10.3 on the next one – all the while maintaining a lead for India – and almost level on the 17th – at 10.0. A hundred pairs of eyes almost blanked out all else in these minutes – how three Singaporeans slipped out of contention, how the Mongolian Asian Games gold medallist faltered and the Korean faded away. Three-quarters-way. Ghatkar by now had been inching closer to the gold medal and a quota place based on her miniscule lead. It was here that while on the cusp of having it all – a ticket to the Olympics, great promise of anticipation and hope to go with her potential in the next six months upto Rio and on the brink of joining another talented rifle shooter Apurvi Chandela to revive India’s best shooting showing in women’s rifle from a decade ago, Ghatkar’s hand would involuntarily jerk. “It happens” was all that even the most articulate of experts could say of the moment, when the 27-year-old – who many would desperately hope stays motivated for Tokyo when she’s 31 – would flinch and miss. She would shoot a shocker of a 8.8, and you could see wincing pain on faces of even the neutrals watching here, for such had been the hypnotism of the two girls’ competing shots like a Isner-Mahut Wimbledon rally. Ayonika Paul would raise hopes of a gold by shooting 10.7 on the penultimate shot, but live to regret the last 9.9 she shot that cost her gold. “The last two shots are still ringing in my mind. I was here to win gold but the Iranian finished strongly. I will start training again from tomorrow morning itself to ensure I improve on my first and last shots. I am happy at having won the quota but disappointed at losing out on the gold,” she would say eventually. Would face the pressure of a chasing pack and will no doubt face sleepless nights about her 8.8. She would still smile her way through the bronze medal ceremony, though everyone would pause to congratulate her on a fine afternoon before they went to Ayonika to cheer the quota-plus-medal.